CINCINNATI — Ohio Governor-Elect Mike DeWine and Kentucky Gov. 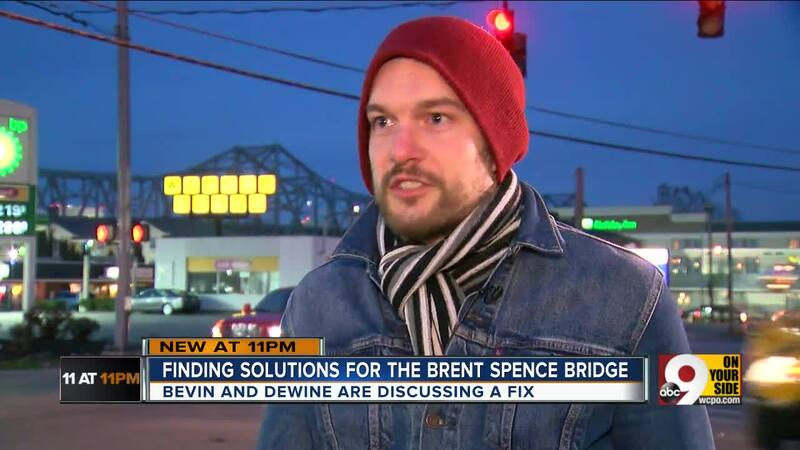 Matt Bevin have already begun talks about soothing the 57-year-old infrastructure sore that unites their states: The Brent Spence Bridge. Longtime Cincinnatians might be understandably skeptical of seeing any progress on the notorious structure, which experts estimate carries more than triple the traffic it was designed to accommodate each day. Its shortcomings and the urgent need to replace it have been apparent for years. In a 2011 speech, then-President Barack Obama pointed to the aging bridge as an example of an infrastructure crisis and implied only Republican opposition to his jobs bill was preventing its renovation from starting. Five years later, then-candidate Donald Trump gave a speech promising to fix it if elected. He was. The only visible change since then? The bridge’s parody Twitter account became more active. The primary obstacle to replacing the Brent Spence was and is the anticipated $3 billion price tag, WCPO transportation reporter Pat LaFleur said. If Bevin and DeWine are seriously discussing a solution, that conversation likely involves tolls. Although a 2017 survey conducted by the Cincinnati USA Regional Chamber found 61 percent of respondents were willing to pay $1 to cross the bridge if it would fund a replacement, Bevin was strongly opposed to the idea when he ran for governor in 2015. So was Britni Lawson, an Uber driver who Friday night described it as a nightmare for her profession. “Absolutely ridiculous,” she said. “I don't even know how that can happen. I'm an Uber driver, so I go back and forth every day, all day. That would just be a hot mess and expensive."